The $26 Billion Woman Posted in: Featured, People - Read the Washington Business Journal profile on Amy Raskin, Chief Investment Officer, at Chevy Chase Trust. Investment Update, First Quarter 2019 Posted in: Investment Update, Latest News - The market has been on a wild ride. December 2018 was the worst December for the S&P 500 since 1931. Then, the first quarter of 2019 was the best first quarter in over 20 years. From sentiment to markets to economic data, there are a plethora of opposing extremes. Food for Thought: Next Generation Automation Posted in: Latest News, Noteworthy, Video - Bobby Eubank, Research Analyst, discusses our current thinking about one of our global themes. Bobby Eubank, Research Analyst, discusses our current thinking about one of our global themes. Laly Kassa featured in Barron’s: The Single Woman’s Guide to Retirement Planning Posted in: Insights, Latest News, Noteworthy - Anyone who has ever spent a frustrating few hours clothes shopping knows that one size doesn’t fit all. When it comes to retirement, many women, in particular, need a custom fit. Anyone who has ever spent a frustrating few hours clothes shopping knows that one size doesn’t fit all. When it comes to retirement, many women, in particular, need a custom fit. Because the risk of running out of money is greater for single than married women, some advisors favor a more conservative approach to financial planning. They assume lower expected returns on an investment portfolio to account for possible market volatility and higher costs in retirement. And, while women tend to provide much of the caregiving to others, they often end up without any such help themselves. It’s one reason why the majority of nursing-home residents are women. Some people can pay out of pocket for long-term care, but many advisors recommend that single women analyze whether buying some level of insurance to help with such aid is warranted. “What we tend to see is that the first phase of long-term care tends to come from family members. For those who don’t have children or family near, you have to be more careful about costs because the clock on costs starts on day one,” says Laly Kassa, a certified financial planner at Chevy Chase Trust, which oversees $27 billion in assets. Ellen Perry, Founder and Principal of Wealthbridge Partners, speaks with Chevy Chase Trust Posted in: Latest News, Noteworthy, Video - Ellen Perry recently sat down with Chevy Chase Trust to talk about the question she gets asked most frequently from wealthy families. Ellen Perry recently sat down with Chevy Chase Trust to talk about the question she gets asked most frequently from wealthy families,“How Do I Pass on Values to the Next Generation?” Hear Ellen describe successful strategies and potential pitfalls as she draws on experience from a lengthy career advising families of great wealth. Amy Raskin featured on CNBC’s Fast Money Halftime Report – February 4, 2019 Posted in: Latest News, Noteworthy, Video - Amy Raskin, Chief Investment Officer, appeared on CNBC's Fast Money Halftime Report on February 4, 2019 to discuss current market conditions and what they mean for investors. Amy Raskin, Chief Investment Officer, appeared on CNBC’s Fast Money Halftime Report on February 4, 2019 to discuss current market conditions and what they mean for investors. Spencer Smith featured on IREI’s Shop Talk Podcast Posted in: Insights, Latest News, Noteworthy - What are the advantages to thematic investing — as well as the pitfalls? Spencer Smith, head of institutional investments discusses these questions on the Real Assets Adviser ShopTalk podcast. What are the advantages to thematic investing — as well as the pitfalls? How often does thematic investing need to be reassessed and potentially refreshed? Spencer Smith, head of institutional investments discusses these questions on the Real Assets Adviser ShopTalk podcast. Chevy Chase Trust Company provides this communication as a matter of general information. The opinions stated herein are those of the author and not necessarily the opinions of Chevy Chase Trust Company or any of its affiliates. Portfolio managers at Chevy Chase Trust Company make investment decisions in accordance with specific client guidelines and restrictions. As a result, client accounts may differ in strategy and composition from the information presented herein. Any facts and statistics quoted are from sources believed to be reliable, but they may be incomplete or condensed and we do not guarantee their accuracy. This communication is not an offer or solicitation to purchase or sell any security, and it is not a research report. Individuals should consult with a qualified financial professional before making any investment decisions. Past performance is not indicative of future returns. All investing involves the risk of loss. Amy Raskin featured on CNBC’s Fast Money Halftime Report Posted in: Noteworthy, Video - Amy Raskin, Chief Investment Officer, appeared on CNBC's Fast Money Halftime Report on August 28, 2018 to discuss current market conditions and what they mean for investors. Is today’s positive vibe on the economy based on sentiment or fact? Amy Raskin, Chief Investment Officer at Chevy Chase Trust, recently discussed market conditions and what they mean for investors on CNBC’s Fast Money Halftime Report. She also shared three stocks that have her attention. Food for Thought: When and How to Speak to the Next Generation About Wealth Posted in: Latest News, Noteworthy, Video - We are asked a lot of questions about when and how to speak to the next generation about wealth. So as food for thought, we are sharing the answers. Having more money than you need can give your children a soft landing, a firm financial start, or — if you prepare them in the right way — both. The key to meaningful conversations about family wealth management has less to do with timing and more to do with how you approach it. Larry Fisher, President of Family Wealth, shares three tips for laying the groundwork for continued financial stability. Chevy Chase Trust Supports Community Foundation’s Annual Celebration of Giving Posted in: Events, Latest News, Noteworthy - On Thursday, November 1, 2018, The Community Foundation of Montgomery County hosted its annual Celebration of Giving. 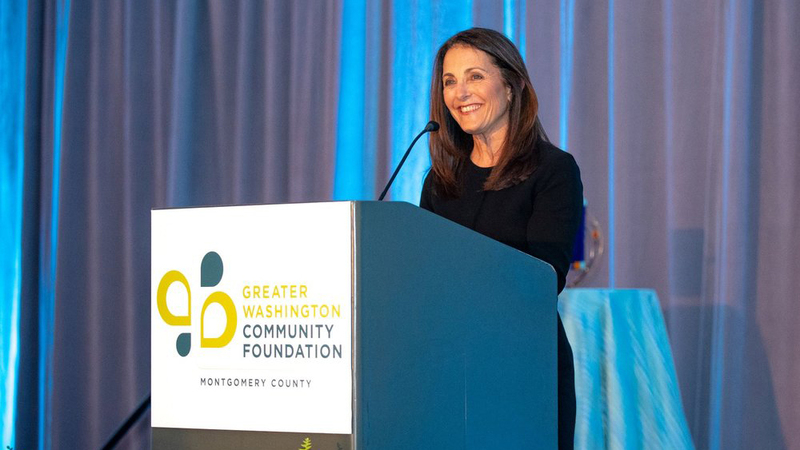 On Thursday, November 1, 2018, The Community Foundation of Montgomery County hosted its annual Celebration of Giving. Chevy Chase Trust was proud to sponsor the event for the sixth year in a row. The night honored their 2018 Philanthropist of the Year, Linda Youngentob. Linda has been a part of numerous philanthropic endeavors over the years. In 1992, she spearheaded the first Mitzvah Day at Washington Hebrew Congregation, the congregants of which were spurred to volunteer with local nonprofits. As a result of her efforts, Mitzvah Day has been adopted by synagogues all around the world. Her philanthropic efforts have also included aiding youth in achieving higher education goals, especially those who may not otherwise graduate. She has worked with CollegeTracks, FutureLink, and Identity, Inc. to name a few. Craig Pernick, Chevy Chase Trust’s Head of Fixed Income, attended the event and stated that he always feels more motivated and inspired afterward. “It was uplifting to see such a wide range of people involved in philanthropy, from donors to volunteers, and government agencies to small and large charities. It is so wonderful to see that the DC area has such a vibrant, charitable community,” Pernick said. The event brought together more than 350 individuals to recognize Linda, as well as the other donors and leaders who make up our local charitable community. On November 28, 2018, Chevy Chase Trust hosted Leaders & Lunch featuring Ellen Perry, Founder and Principal of Wealthbridge Partners, who spoke about “How to Pass on Values to the Next Generation.” Having spent more than thirty years working with families of wealth, Ellen described the differences between values and preferences, and the importance of storytelling, embracing diversity and living a life that reflects values. She assured her audience that values are almost always successfully passed down. The key is passing them with intention. Ellen stressed the significance of embracing diversity in the family and “pitching a big tent.” She remarked that getting curious about the differences in a family member’s preferences can eventually lead to acceptance and stronger relationships. During her presentation, Ellen recommended the use of Kelly Crace’s Life Values Inventory, a free values assessment tool. She suggested that family members use this assessment to gain clarity and insight into their priorities and later share the findings as part of a family discussion. This exercise often leads to a better understanding of the varied perspectives and promotes good communication, a vital aspect of successful familial relationships. Ellen Perry is the Founder & President of Wealthbridge Partners, LLC. She has 25 years of experience serving as a strategic advisor for families of substantial wealth. Before founding Wealthbridge Partners, Ellen was the co-founder and CEO of Asset Management Advisors (now GenSpring Family Offices), a multi-client family office, and Teton Trust Company, its affiliated private trust. Ellen, the author of A Wealth of Possibilities – Navigating Family, Money and Legacy, is a frequent speaker, author and advisor on family wealth strategies that create and sustain great families throughout multiple generations. Her work and opinions have been quoted in numerous publications including the Wall Street Journal, New York Times, and Fortune Magazine. Food for Thought: Why Invest in Individual Bonds Versus Mutual Funds and ETFs? Posted in: Latest News, Noteworthy, Video - We receive a lot of questions about investing in individual bonds versus mutual funds, so as Food for Thought we are sharing the answers. Invest in concepts, not conventions. Our approach seeks opportunities across asset classes and around the globe. Perhaps our single most important distinction is this: At Chevy Chase Trust, we invest in global themes. We build equity portfolios of companies positioned to exploit powerful, secular trends, disruptive ideas, innovations, and economic forces. Different by design, and planning. The smartest investment strategies are informed by sound financial planning. Our clients appreciate an integrated approach and the difference it can make. Explore the difference in our financial planning, thematic investing, risk management and fixed income strategies. Sometimes the greatest returns come from investing in people. We’ve created a culture that values service over products, long-term goals over short term quotas, and your success over anything else. Our team of 90 professionals is comprised of CFAs , MBAs, CFPs® and other specialists in global research, thematic investing and planning. Chevy Chase Trust is an investment management firm and think tank specializing in global thematic investing and planning. We provide individuals, families and foundations with an alternative to institutionalized money management and pursue the greatest potential in each client’s unique financial situation.